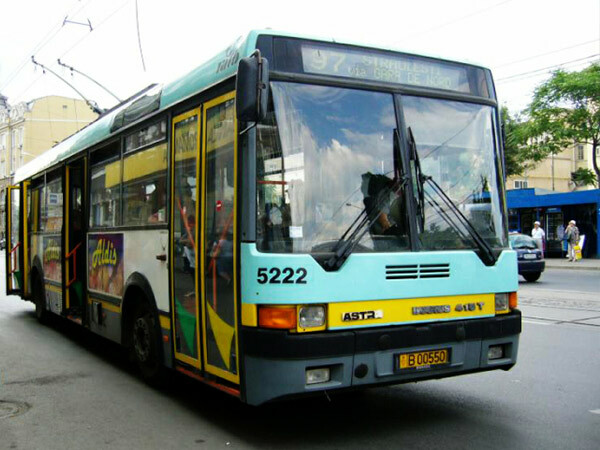 200 of these trolleybuses have been produced between 1997 and 2002 in Ikarus factory in Hungary and have been equiped in Astra Bus in Arad. Initialy they have been given to the Bujoreni Depo in Bucharest (100 pcs.) and Vatra Luminoasa Depo in Bucharest (100 pcs.). 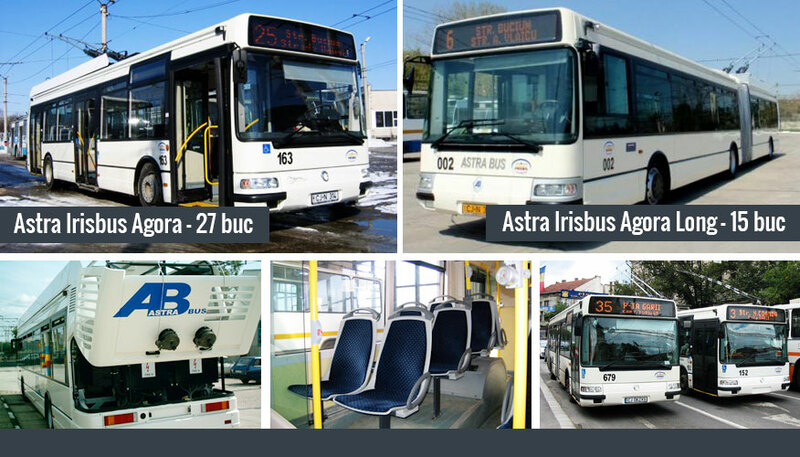 Beginning with year 2007, some of them have been moved to the other Depos (Berceni and Bucurestii-Noi, both in Bucharest), after the new Astra Irisbus Citelis arrived. 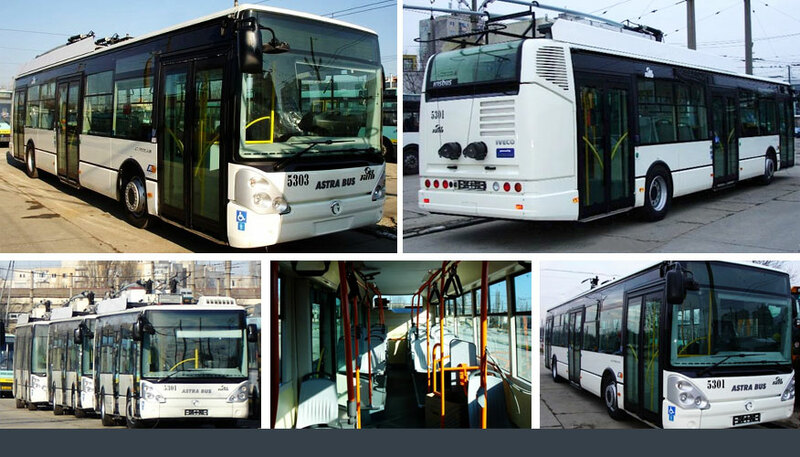 Astra Irisbus – Agora is a solo urban trolleybus with low floor, with carbody by Astra Bus Arad on an Irisbus underframe (Iveco’s division for passenger transportation vehicles). 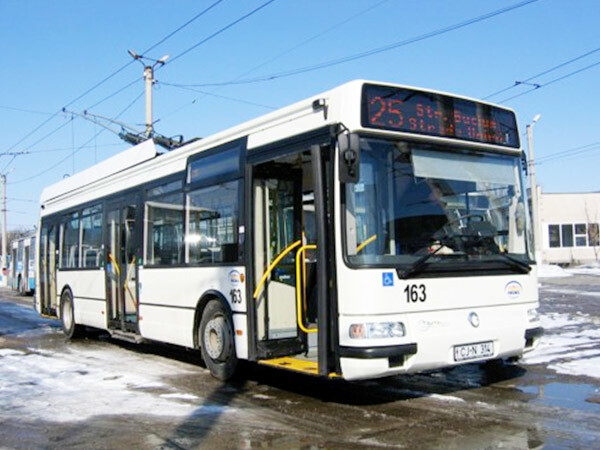 Traction equipment and static converter for auxiliary services have been developed and produced by ICPE SAERP S.A., and the electrical traction motor (type TN96A – 150kW) has been supplied by UME Bucharest. 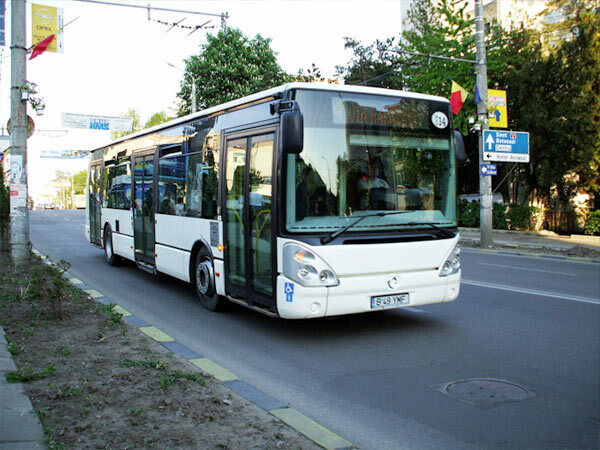 Pentru autobuzul diesel Irisbus Agora Long a existat o conversie in troleibuz articulat actionat cu motor electric asincron trifazat. 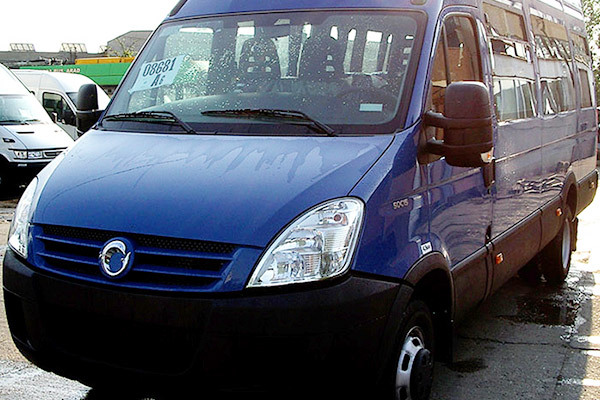 These vehicles have been brought in 2007-2008. 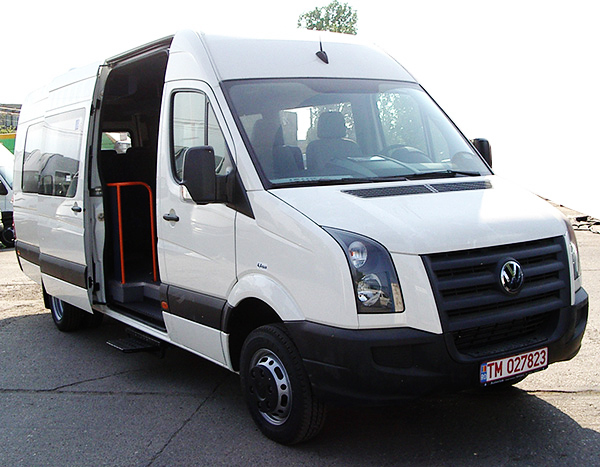 They are low floor vehicles and they have two models –Citelis 12 with a length of 12 meters and Citelis 18 with a standard length of 18 meters. 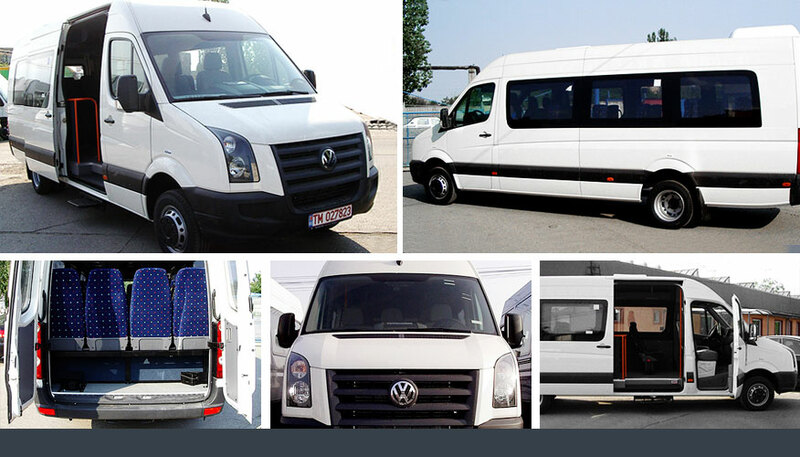 These vehicles are in Buchares in the Depos Vatra Luminoasa and Bujoreni. 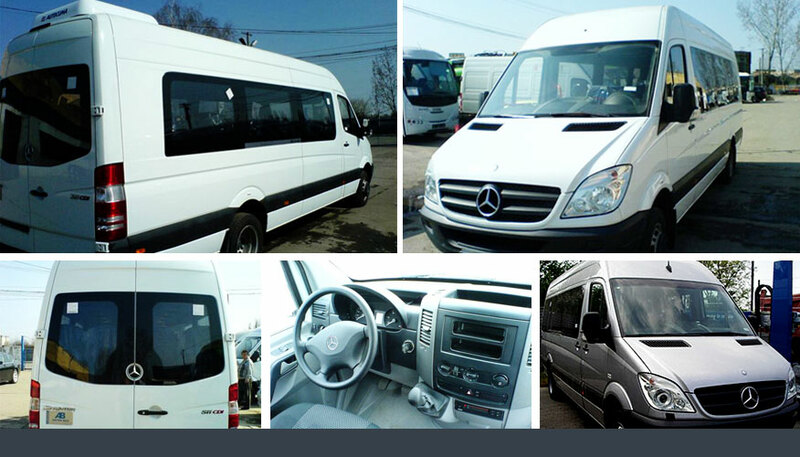 They are equipped with traction system in AC. 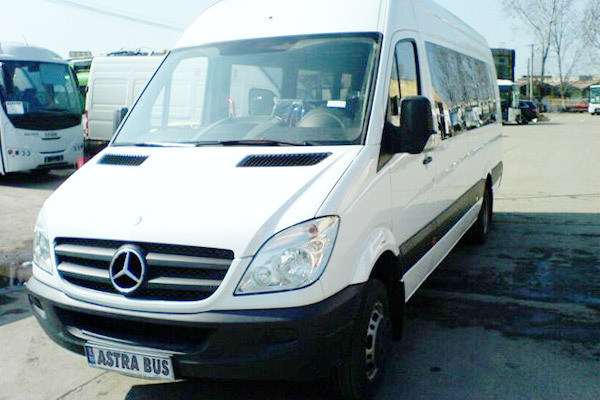 Astra Irisbus Citelis 12 are o lungime standard de 12 m.
Troleibuzul articulat Astra Irisbus Citelis 18 are o lungime standard de 18 m fiind complet multipexat, cu microprocesor, tractiune cu motor trifazat asincron, 240kW. 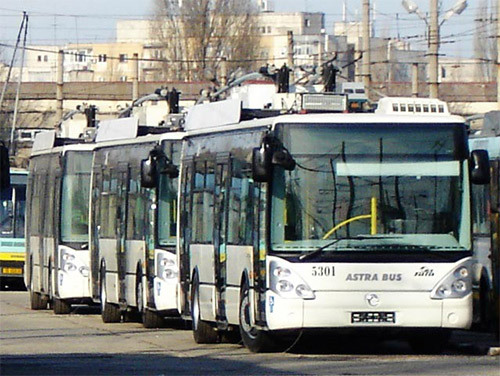 Urban solo trolleybus with a low floor, bodywork by Astra Bus Arad, on an Irisbus under frame (Iveco’s division for passenger transportation vehicles). 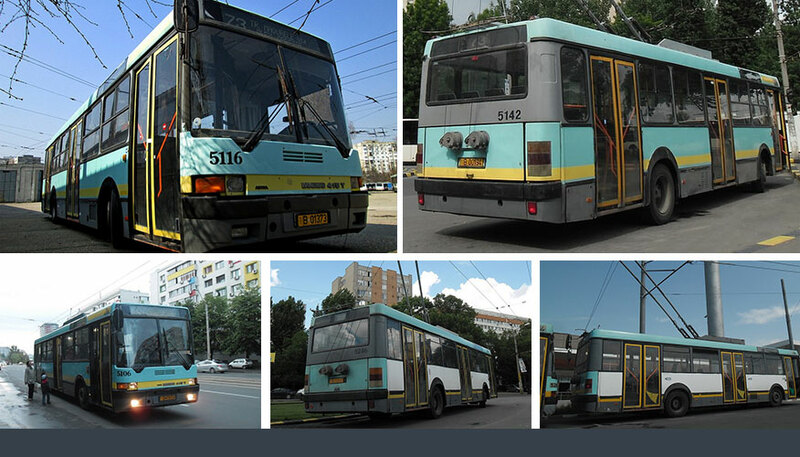 Trolleybus electric thrusters are the latest generation with low power consumption and regenerative electric brakes. 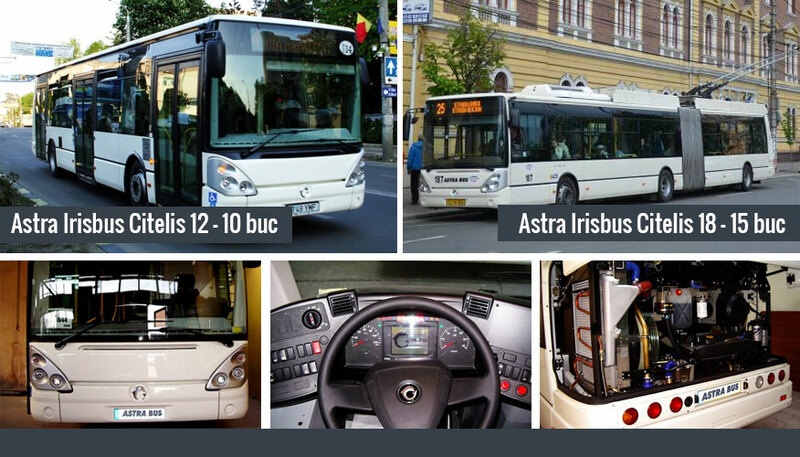 Digital control of all systems of electric buses allow easy maintenance and repair of the vehicle. Troleibuzul corespunde cu toate normele europene în vigoare incluzând facilităţi precum podea coborâtă pentru accesul facil al pasagerilor, sistem de “Kneeling” permitând înclinarea vehicului în staţie pentru accesul pasagerilor cu handicap locomotor şi pasagerilor cu cărucioare, rampă pentru accesul persoanelor cu scaun cu rotile. 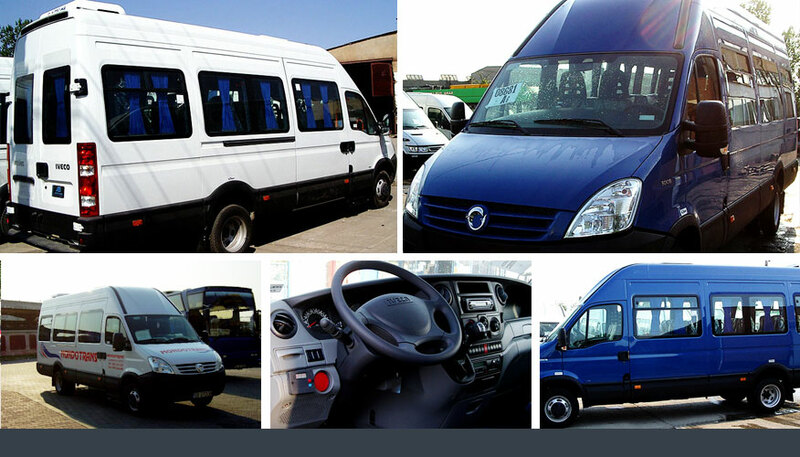 New Iveco Daily 50C15V is equipped with an engine of 146 hp and a manual gearbox 6 + 1.Are length 7012 mm and 3950 mm wheelbase.